The purpose of the Quality Assurance and Quality Control (QA/QC) Program is to ensure that the environmental data generated by the Division of Water Quality (DWQ) and its cooperators is of known and suitable quality and quantity to meet DWQ’s water quality monitoring goals and objectives. 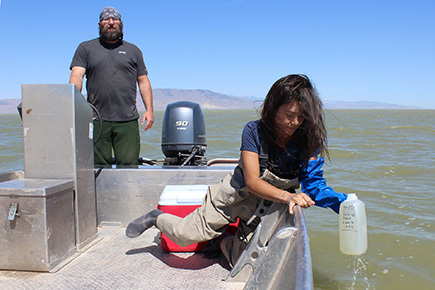 High-quality data enables DWQ to make sound decisions affecting Utah’s water quality. A key aspect of DWQ’s QA/QC program is documentation. The Division’s Quality Assurance Program Plan (QAPP) is meant to be an umbrella document outlining the minimum QA/QC requirements for environmental data collection. Standard Operating Procedures (SOPs) describe how DWQ collects, handles, processes, and analyzes environmental data. DWQ generates SOPs for any procedure that becomes routine, even when published methods are utilized. The use of SOPs ensures data comparability, defensibility, accuracy, and reduces bias. Field manuals are produced when a set group of SOPs is used routinely for a specific monitoring program, such as the case for the Utah Comprehensive Assessment of Stream Ecosystems (UCASE) Program.